Contact Details : Contact The Authorised Officer, T .Vijaya kumar, Phone No. 9176692690, 9952542702. 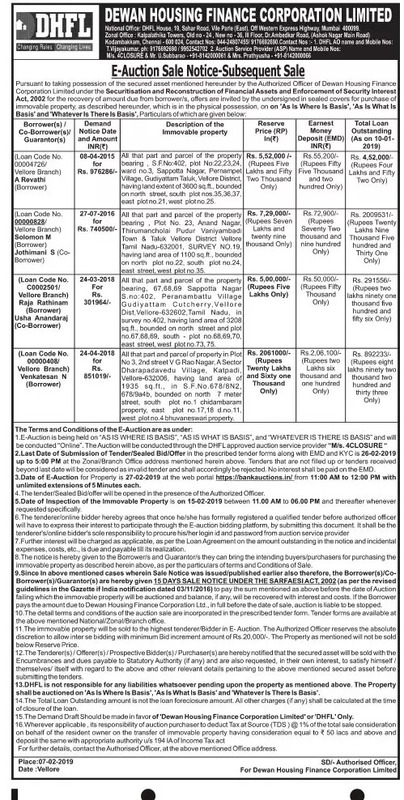 Schedule of Property : All that part and parcel of the Property in plot No 3,2nd street V G Road Nagar,A Sector Dharapadavedu Village,Katapadi Vellore ,having land area of 1935 sq ft in sf No 678/BN2,67/9 a4b, Bounded By : North : 7 meter street, South ; Plot no 1 Chidambaram Property, East : Plot No 17,18 d no 11, West : Plot No.4 Bhuvaneswari Property. Inspection Details : For Inspection Details Please Contact The Authorised Officer, T .Vijaya kumar, Phone No. 9176692690, 9952542702, Date & Time Of Inspection Of The Property On 15.02.2019 From 11:00 AM To 06:00 PM.